Just in time for Chanukah! 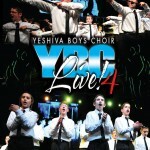 EG Productions will be releasing YBC Live 4, featuring everyone’s favorite boys choir live in concert, six music videos, a behind the scenes peek at YBC, a hilarious blooper reel and an all new song to debut on this exciting DVD/CD. Distributed by Sameach Music, expect it in stores on Sunday, December 18th.